The end is near on the bathroom remodel. I can almost hear angels singing! I am not sure why, but this project has been a rough one. I think we are just tired. And old. 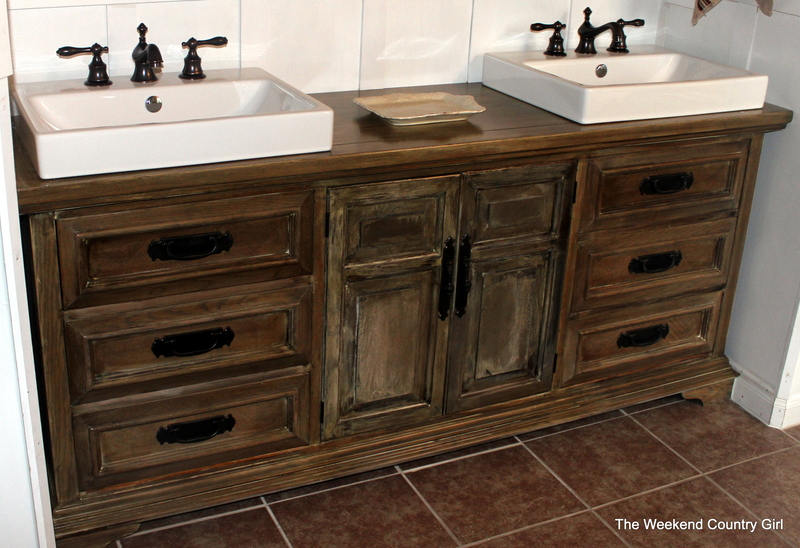 By far my favorite thing about the bathroom is the dresser we bought that I repurposed into a bathroom vanity. 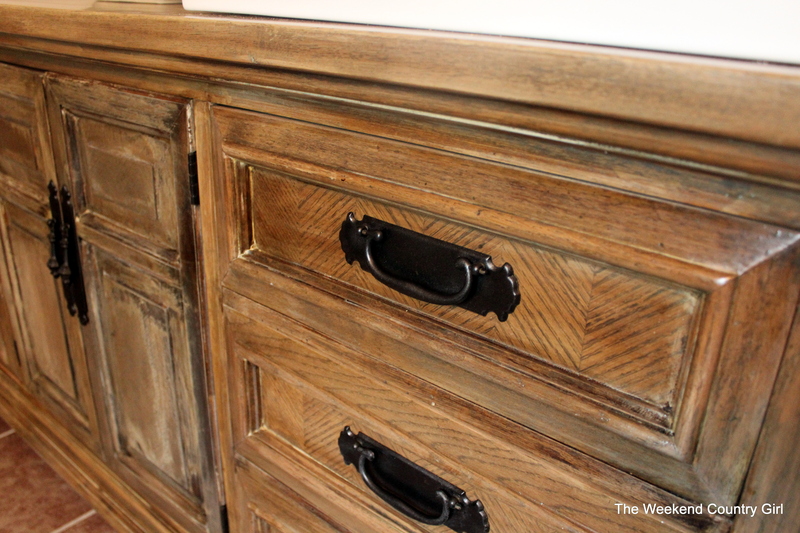 I love the Restoration Hardware look of the refinished wood, I like the wood top- that we have covered with a million coats of marine varnish to protect it from water, I now have better storage in the vanity, and I like that it looks like furniture in the bathroom. 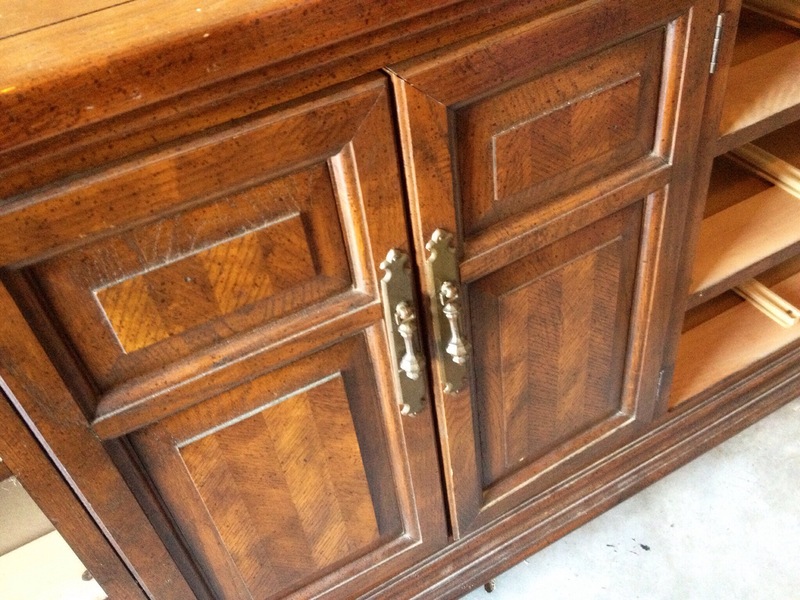 It was tough finding a solid wood dresser that was 72 inches long. I paid too much for it ($200.00), but after a month of searching this one spoke to me. I could not find any that were crazy enough to put TWO sinks in a dresser. I think that should have given me a hint… but I am a stubborn sort of girl. 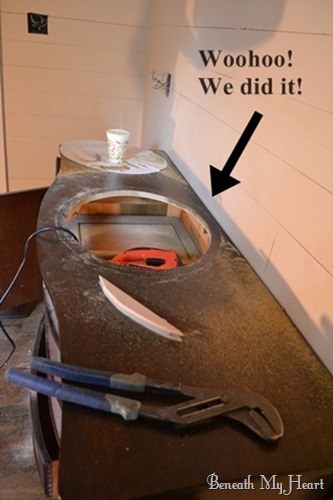 Hubby cut the holes in the top of the vanity for the sinks while I was at work one day. I was so excited with how they looked! Step one was to remove the old vanity without destroying the plumbing. A rotozip took care of getting the back board cut out. 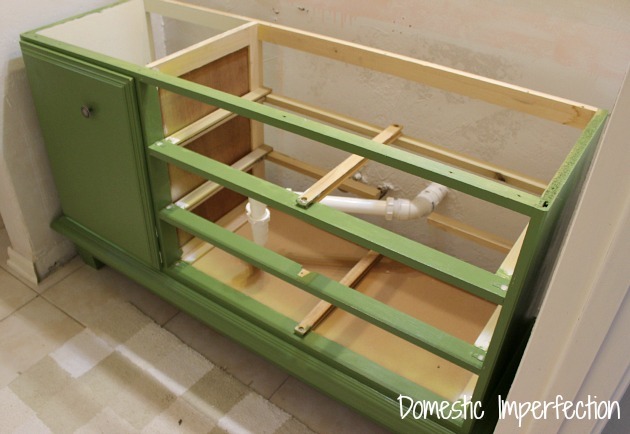 Step three is to move the dresser into place, drop in the sink and connect the plumbing. All the drawers will be out, we took a section of the back of the dresser off where the plumbing would go and even had to remove a few cross bars that will have to be reinstalled or reworked when we are finished. We opted to do a sort of modifed version of what An Oregon Cottage did. The bottom drawer just needed a cut out scoop on the very back. 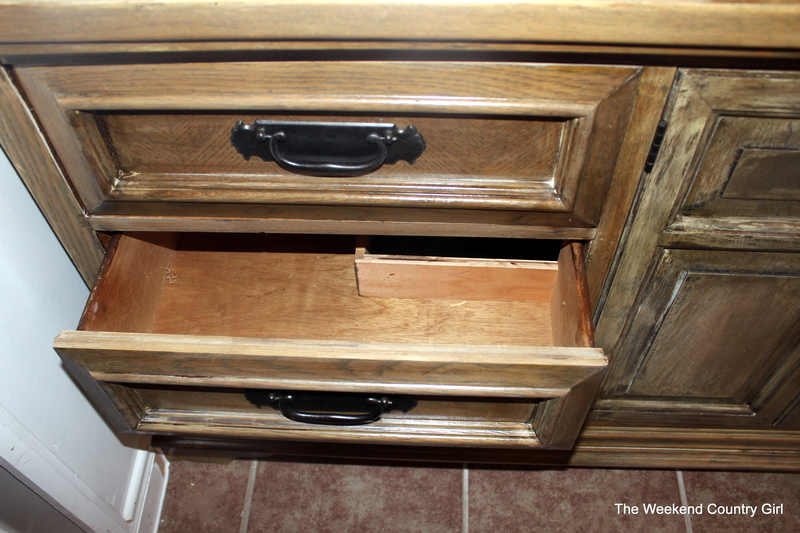 The middle and top drawers needed to be L shaped in order to miss the plumbing. It isn’t pretty, but I have a ton more storage than before. 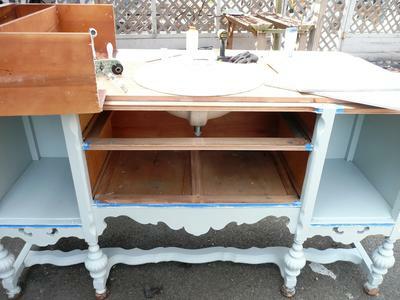 I am going to get it all stained and sealed soon. I pinky promise. 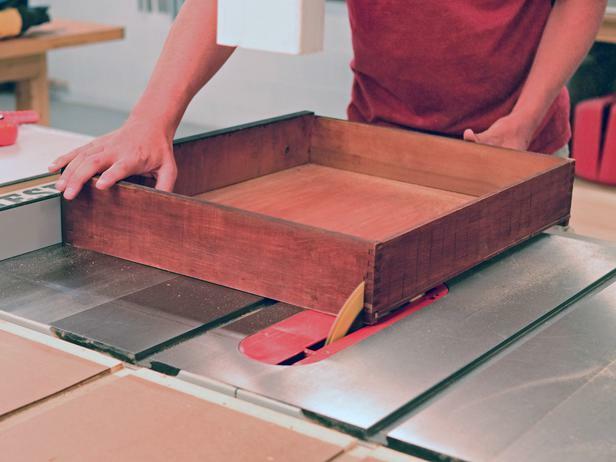 We removed one drawer from the middle section to allow for taller items like cleaners. Here is the finished product. I am so very happy with how it turned out. Enjoy. The color is off in this shot but you can see the finished look. This is the best shot of the dresser and the mirror together I can get in the narrow space. Love the pieces together. The light will change. I just have to find the right one. You get the best representation of the finish on this shot. We have the most amazing natural light in the bathroom. I love how it reflects around the room. Thanks for putting up with my way too long bathroom reno. I hope you like the look as much as we do. 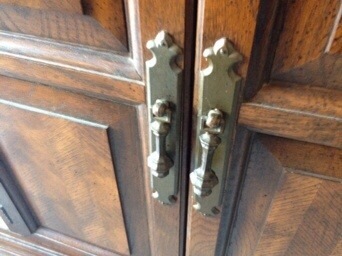 I still have doorknob towel holders to add and a little touch up paint to do before we can call it DONE! I hope you enjoy the look as much as we do and our struggles inspire you to try something out of the ordinary at your home. Great job, it looks amazing! I now can get a good idea how two totally different pieces can look great together in the same room. You continue to be a great inspiration! It really wasn’t too hard once we dove in. Getting the room ready was the tedious part. Good luck. Looks BEAUTIFUL!!! So talented you both are. Love this! 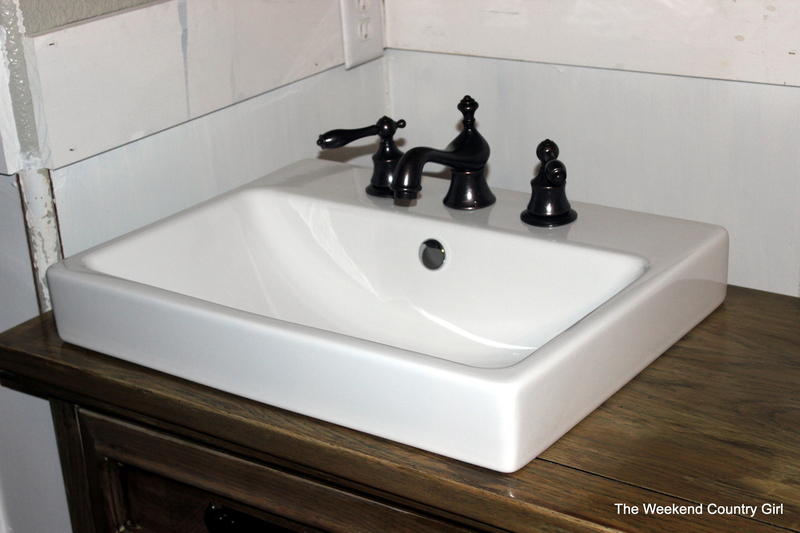 What is the name of the sink from Home Depot? It is $87.00 on the website now. Thanks so much for your reply! Appreciate it! I hope your project goes well. Share pictures when you are done. Best of luck. 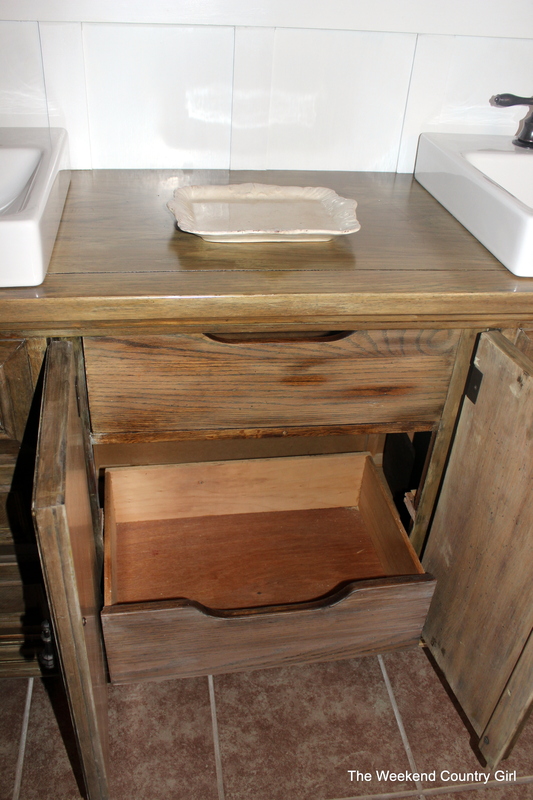 Our dresser-turned vanity is 32 inches tall. We are both really tall, and it is not uncomfortable. The sinks on top add height. Good luck! 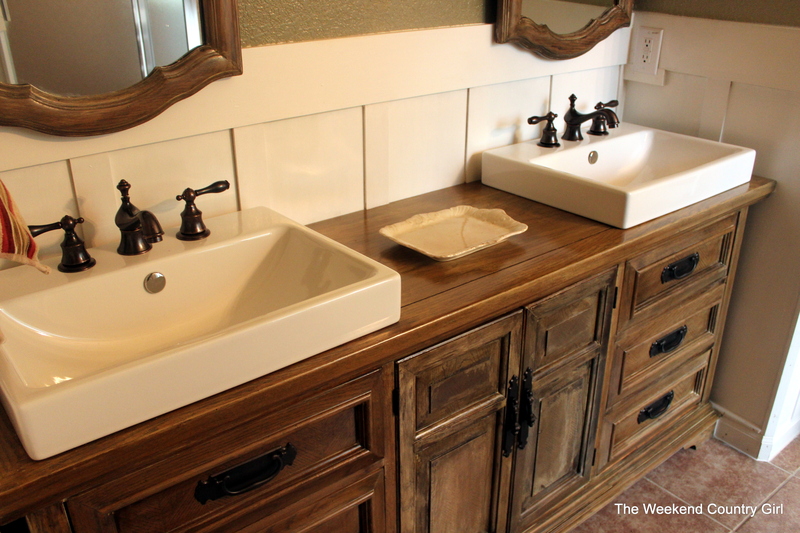 I love the dresser used as the bathroom sink. Can you tell me where you found it? 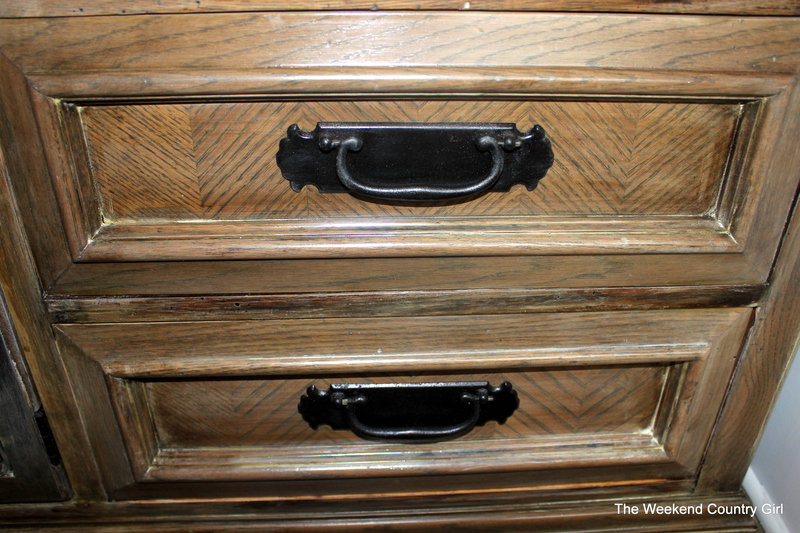 The dresser was purchased on Craig’s List and totally refinished to look more like a Restoration Hardware piece. The instructions are on another of my blog posts. I am glad you like the dresser. Can you tell me how far the sink comes out from the wall? I am looking at the same sink at Lowe’s. The dresser I have is 16 1/2 inches deep and the spec sheets on Lowe’ s says the sink is 17″ in depth but sometimes those specs aren’t exactly right. None of the stores near me have the sink in stock so before I order it I’d like to know if it will fit. It is 17 inches exactly. 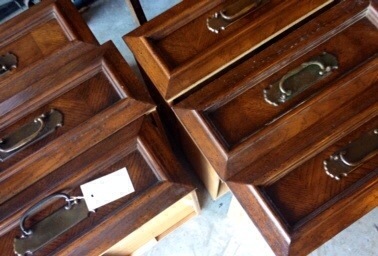 We had a deeper dresser. Our sink is two inches from the wall. I just checked and the don’t seem to carry them any longer. If I understood correctly the overmount sinks take up more room than an under mount as far as plumbing goes. 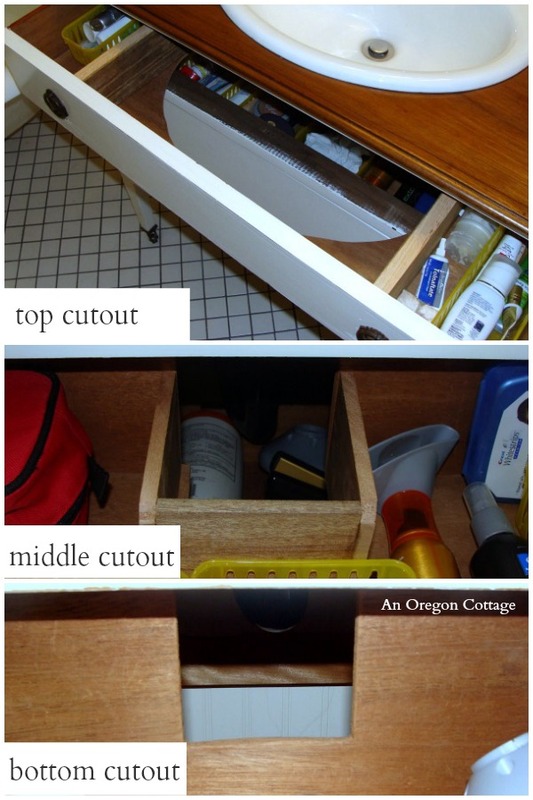 So if we did the overmount we probably wouldn’t be able to have storage underneath except in the middle? 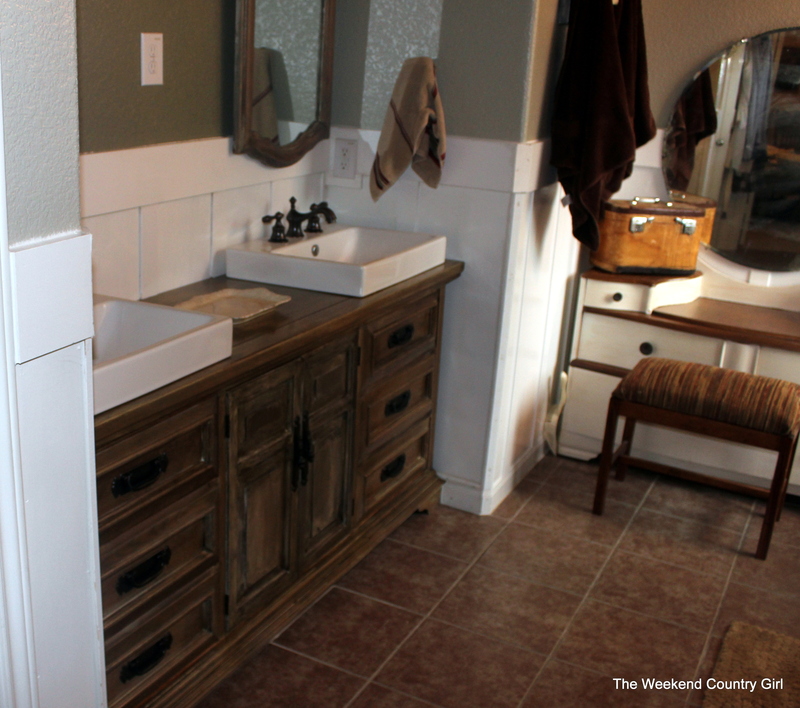 I love the way yours looks and was hoping to do one like it for our new bathroom addition but we do want storage too…thoughts? 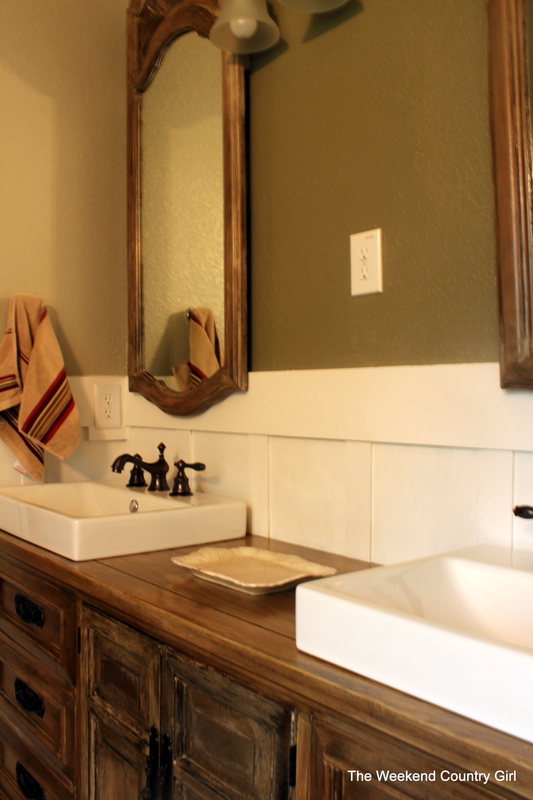 or is it possible to see a pic of the inside under the sinks…? 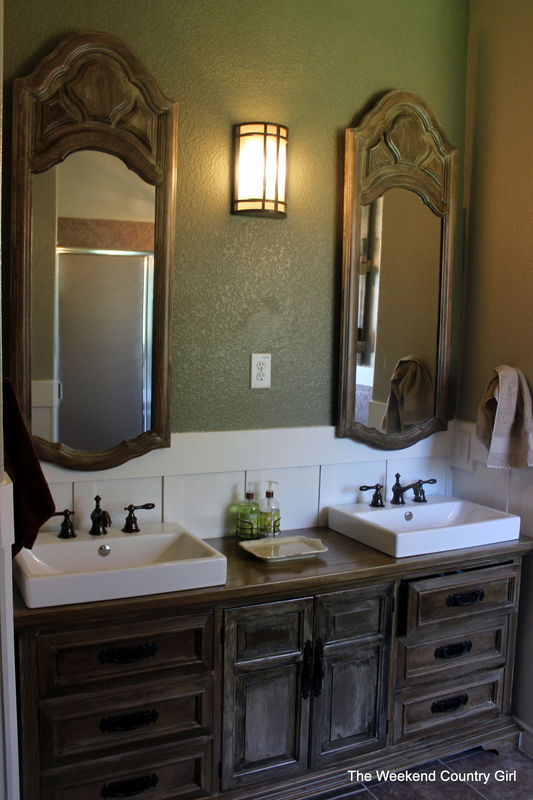 That’s probably too much to ask… I’m just having trouble finding many posts with the overmount sink. I had read some of the ones you mentioned. 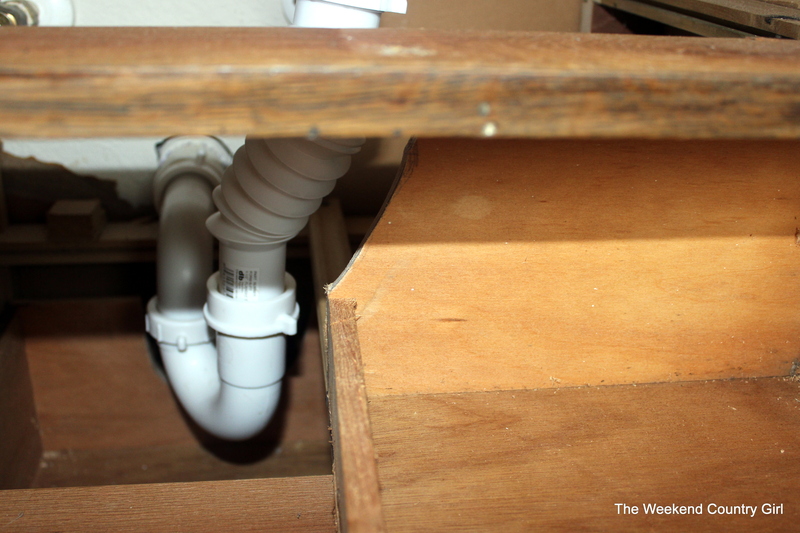 Actually the over mount sink helped with storage because the pipes are higher in the dresser. I am glad I chose over mount sinks. This is exactly what I want to do in my bathroom! Thank you for the inspiration!